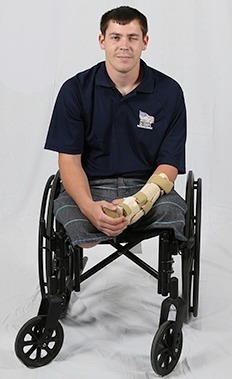 In his specially adapted Homes For Our Troops home, Isaac is able to focus on his future without having to worry about moving apartments frequently. With this stability, his daughter now has a place she can call “home.” The special adaptations Isaac enjoys the most are the pull-down cabinets and lower countertops, making it easier for him to reach appliances while in his wheelchair. Originally from Wisconsin, Isaac chose to build his home in California to be near the VA and his sister. Isaac would like HFOT’s supporters to know their donations are going to a good cause and this home is making a difference in his daily life. “The home has brought a sense of security and comfort in my daily life,” he says.